The #GuptaLeaks project was published online on the websites of the three participating media outlets – amaBhungane, Daily Maverick and News24 teams, as well as on their purpose-built #GuptaLeaks website. The runners-up: Jacques Pauw and Hennie van Vuuren, for their published books on the President’s Keepers and Apartheid Guns and Money, respectively. Read the Taco Kuiper Award winner’s story and the full speech by Adj Prof Anton Harber here. See previous winners and runners-up of the Taco Kuiper Award. See the media release here. 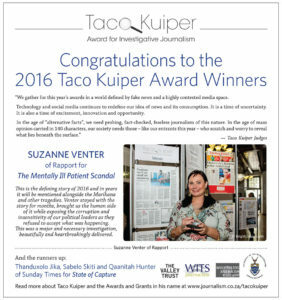 The winner of the 2016 Taco Kuiper Award for Investigative Journalism was Suzanne Venter for her investigation into the “Pasiënte ‘soos honde’ in tehuis” [The mentally ill patient scandal. The story looked at the Gauteng health department’s ill-conceived plan to save money by ending its contract with four Life Esidimeni hospitals. The runners-up: Thanduxolo Jika, SAbelo Skiti and Qaanitah Hunter of Sunday Times for State of Capture. 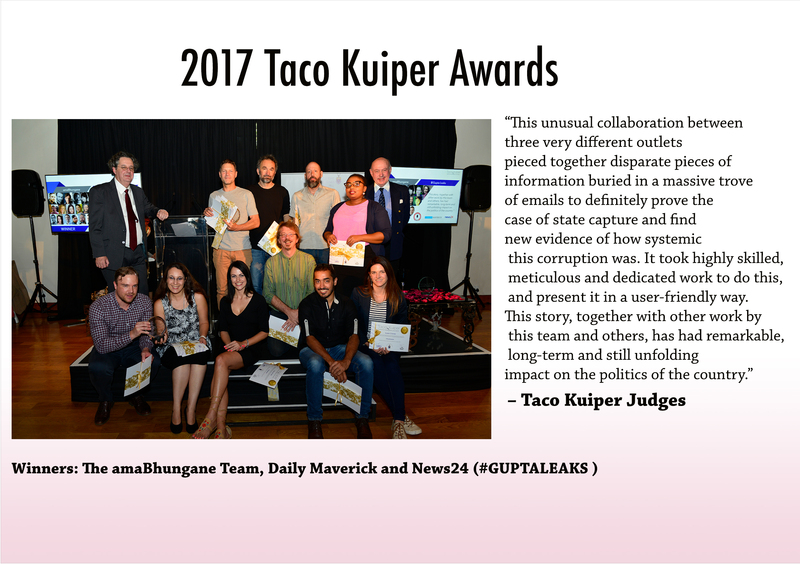 The winners of the 2014 Taco Kuiper Award for Investigative Journalism are Sipho Masondo and Paddy Harper, of City Press, for their investigation into the selling of teacher’s jobs: How Sadtu decimates our education system, one school at a time. Miners Shot Down, the film about Marikana, by Rehad Desai and Anita Khanna of Urhuru Productions, was runner-up. Nick Davies of the London Guardian was the keynote speaker. The 2013 Taco Kuiper Award went to amaBhungane, the M&G Centre for Investigative Journalism. The team of reporters was represented by Stefaans Brümmer, Sam Sole and Vinayak Bhardwaj. Announcing the Award at the Rand Club, Johannesburg, Anton Harber, Caxton Professor of Journalism and Media Studies at the University of the Witwatersrand and convenor of judges said “This was undoubtedly the story of the year, in fact of the last five years, and maybe the next five. Central to the team’s reporting was a PAIA, Promotion of Access to Information, request, which finally bore fruit in 2013, when a vast horde or 12 000 documents were handed over. The judges said of the winners: “East London’s newspaper has identified a way of taking one small item – in this case a remark by an MEC that prisons were ‘far better’ than the Eastern Cape’s rural school hostels – and turning it into a major investigation. Msindisi set out to visit 70 school hostels. Forty of them turned out be ghost hostels, and did not even exist, and those he saw over two months allowed him to document horrifying conditions. “This was not a story that arrived in an envelope or was the result of a lucky leak. It required many weeks on the road, visiting each school across the length and breadth of the Eastern Cape to document the appalling conditions in which students had to live. Mac’s dodgy millions“The judges said of the winners: When one takes on a man like Mac Maharaj, one has to have a cast-iron case. That is not easy when it is a case which has stymied the Scorpions. The Sunday Times team spent months pursuing it and found the smoking gun: a consultancy agreement that set out how money would flow from a company bidding for a major tender with Maharaj’s department to his wife. They had dates, amounts and bank account numbers – the detail that turns a good investigation into a great one. Maharaj could not take action against the paper, as he had done elsewhere. Mzilikazi wa Afrika and Stephan Hofstatter, Sunday Times: “Police commissioner and the SAPS lease”. The story by Mzilikazi wa Afrika and Stephan Hofstatter was an extraordinary account of how the Police Commissioner Bheki Cele had influenced a R500-million lease deal with businessman Roux Shabangu without a proper tender process. The series also detailed a similar lease agreement on the cards in Durban. Two days after breaking the story Mzilikazi wa Afrika was ostentatiously arrested on trumped up charges which were subsequently dropped. Rob Rose, Financial Mail/ Sunday Times: ‘South Africa’s Madoff’. The award was for a series of articles on fraudster Barry Tannenbaum and the way in which he swindled some of South Africa’s biggest and most respected businessmen and investors out of millions, raising questions on how a seemingly well-connected and influential man could deceive so many of his peers. The Judges’ Citation: “The M&G’s extraordinary commitment to the complex arms deal story is bearing fruit as they have in the last year revealed substantially more detail, slowly but surely. The paper, its editor and staff deserve recognition for their doggedness, chipping away at the edifice of secrecy and steadily filling in the detail of what must rate as one of the most important stories of this era. Brett Horner, Chandre Prince and Ntando Makhubu of the Daily Dispatch for Mount Frere Hospital. The Judges’ Citation: “The Daily Dispatch’s expose of neo-natal deaths at Frere Hospital was labelled “false” by the President and “lies” by the Health Minister. On the other hand, our judges called it “a model of excellent and powerful journalism”. In the words of one of the panel, “it has everything we were looking for”. The paper uncovered every aspect of the story, from the highly technical to the human interest; to get to the evidence, they had to use imagination, creativity and some unusual methodology; it had an enormous impact on the country as a whole; and, when facing criticism, from the highest offices, their story held up well, leading to major positive results for the mothers they were writing about. It was the work, over about three months, of Brett Horner, Chandre Prince and Ntando Makhubu. Editor Phylicia Opphelt must be commended for supporting this team and carrying it through with a series of powerful and well-presented stories. Deputy Editor Andrew Trench deserves credit for exceptional news editing in seeing the full potential of a story which started as the complaint of one mother. Great journalism often involves taking a single case and building it into a larger picture which lays out the context, examines the cause and points fingers at the culprits – and therefore has maximum impact.